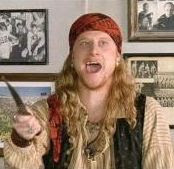 The “garrs” have spoken: International Talk Like a Pirate Day has won as the Best Non-Major Holiday. I’ll make sure I remind ye all when the day arrives, mateys. Speaking of speaking, if you go to Google.com and click on “Preferences,” in the language menu you can choose such languages as “Elmer Fudd” and “Pig Latin.” Also, a new poll is now in place. As for the “Target” part of the title, I wish I had time right now to tell you what happened there last night. Hopefully soon I can fill you in. Happy Labor Day weekend to you all–any fun plans? 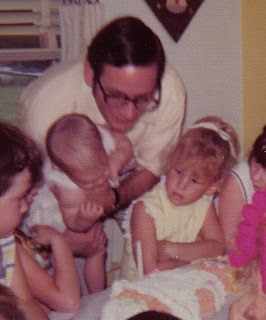 And…Happy 64th Birthday, Daddy (Sunday)! I hope it’s a great day for you. You’re the best father a daughter could hope for. I just wish I could be there for you today, the way you’ve been there for me. P.S. To the (ahem) talented poet who has the most recent comment on “Poet, Interrupted,” calling herself “number 1” – not Commander Ryker, I assume…if you want to rejoice in being old(er) than me, have at it. =) hee hee By the way, thanks for letting me share birthday parties with you (picture at right). Poll update: Capt. Crunch was grateful to tears for being elected the “Next Great Lunch Box.” Be proud, all of you who exercised your freedom to vote. However, Capt. Stubing more than hinted to me that he’s miffed at being slighted in this poll. Random topic: “The Bourne Ultimatum” was a good movie. David and I saw it at our drive-in last weekend (which has the best popcorn, by the way), and we both liked it. I hadn’t seen the previous two. Despite warnings from an anonymous friend (initials K.C.) not to do this, I just read the plot summaries of those first two online and was able to keep up with this third movie. What movies have you all seen (or want to see) lately, either in the theater, DVD, or TV? Did anyone catch the lunar eclipse this week? I didn’t, but Del Tackett from The Truth Project has an interesting blog entry about it – and great picture – here. I’ve always wanted to name a cat “Pickles.” Don’t ask me why. Well, okay, here’s why: It’s such a funny word and would be a funny name, don’t you think? It would be a tongue-twister to say quickly, though. “Heeeeere, Pickles, Pickles, Pickles…” Anyway, speaking of funny names…then came the day that I had a cat named “Gravy.” He had long, cream-colored fur, just the color of chicken-fried steak gravy. Very appropriate name, and I was reasonably sure that no one would copy me when naming their cat. …And as I was petting Gravy, the weirdest thing happened that I’ve kept a secret until now: I was an undercover p.i. with all of Magnum’s buddies, scuba diving to find clues and solving all kinds of crimes. But it came to a sudden end when the tour we were taking halted abruptly in front of Sanford & Son’s house. Then (you guessed it) I woke up. What? You mean that didn’t sound believable? All of the above are parts of several weird dreams I’ve had. All, except for the fact that I want to name a cat “Pickles.” And I will someday, mark my words. In the meantime I’ll just enjoy my odd trips to Dreamland. …But surely some of you would also like to share your weird/funny dreams, right? I can almost guarantee that tomorrow I’ll have another funny dream to share from tonight. Yesterday David and I took a day trip to Cloudcroft, NM, to see David’s parents. They were there for a few days of relaxation. They chose a great place to do just that; many of us know that Cloudcroft is a beautiful mountain village surrounded by towering pines–a perfect escape from the summer heat. While there they took us to a nearby campground to see something in particular. The day before, a big thunderstorm unleashed on the area, bringing lots of rain and hail. …And lightning, evidently. We stopped our car nearby what they wanted us to see: In the middle of the campground stood the thick trunk of what used to be a huge pine tree. I say “used to be” because during the storm a lightning bolt whiplashed it, felling the tree and exposing the pale, fleshy lumber inside. A car was also its victim; in that same split second, the same bolt flung an arc to a nearby car and incapacitated it. The aftermath was a pretty impressive sight. Thankfully no one was hurt. As we drove away it struck me (pun partially intended) how powerful God really is. He is God. His power and glory can be seen all around us, especially in nature. We left that campsite and went about our day. But other things kept catching my notice, from the fragrant wildflower bouquets decorating the edges of the highway, to a photo of a double rainbow my mother-in-law showed me on her camera, to the perfectly round, pea-sized hail cascading outside while visiting The Lodge hotel. Each reminded me of His awesomeness, creativity, and love (yes, somehow the hail even reminded me of His love!). I knew He was there. Have you noticed that sometimes He wows us with a mighty display of His majesty? Often also it’s the smaller, everyday things we see that He uses to invite us to gaze at Him. I’d love to hear from you: When was a time that God used something–maybe in nature, big or small–to remind you of who He is?